More than just a protective barrier, siding can make your home aesthetically appealing. Whether you are building a new home or upgrading an existing residence, there are many siding options available. But first, you have to consider what type of siding is best for you and your home. Do you want durability and little to no maintenance? Is it equally important to you that your siding is made from an eco-friendly material? Advancements in the manufacturing of siding have led to a multitude of products so you have plenty of opportunities to discover the perfect fit. Siding is the layer of material placed on the exposed area of a house. Typically, siding is made of wood, stone, brick, stucco, metal, or synthetic materials. What are the Steps to Siding Your House? Generally, siding covers building material such as wood or concrete block. If you need to know how to estimate siding see our guide. Usually, housing wrap is applied to prevent water infiltration and air leaks. Next, rigid foam sheathing may be affixed. The insulating properties of the sheathing keep your house cooler in the summer and warmer in the winter. It also provides a smooth surface for attaching siding. The siding is installed following specific installation instructions. Before making a decision about siding, you should first think about your requirements and the reasons why you should choose a specific type of siding. Restrictions: You may live in a historic district that has strict rules about siding. If you’re part of a homeowner’s association, you may be prohibited from using certain exterior cladding materials and colors. Climate: Your choice of siding may depend on climate. Conditions like blizzards, hurricanes, high humidity and salty air can decrease the longevity of your siding. House Style: The architectural style of your house may dictate what siding is suitable. Many older homes were originally sided with wood planks. Fortunately, it’s easy today to maintain the character of your house without straying too far from the original design. You can find all forms of siding that are made to look like traditional wood lap siding, cedar shakes or stone. Budget: The price of home siding varies according to the material. Stucco is one of the most expensive options because of the three-coat application process, while vinyl is more reasonably priced. 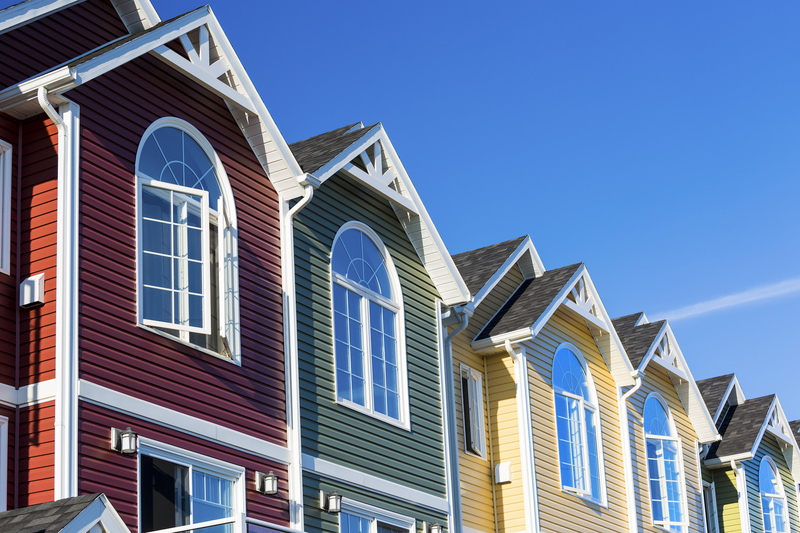 You need to do some research to find an affordable siding that meets your criteria. Maintenance: Your choice of siding will depend on the degree to which you want to deal with the hassle and expense of frequently caring for your siding. Wood siding will require staining or painting and stucco may also need repainting. In addition, wood siding is susceptible to wood boring insects and rot. Brick siding, on the other hand, may last approximately 100 to 200 years, though it may also start to deteriorate at the mortar joints. How Hard is it to Pick Sustainable Siding? These answers will help to pinpoint the sustainability of the material. All siding materials achieve different levels of sustainability. Essentially, the carbon footprint increases when a siding material needs regular maintenance, has a short lifespan, requires long distance transportation or uses a large amount of energy during manufacturing. One trend occurring now is focusing on using more than one type of siding and style of cladding on a house. This may be done by blending varying widths of siding or incorporating various styles together, such as shiplap with cedar shingles in the same color. Instead of brick and stone being used to cover an entire house, it’s used along with other materials to create interesting architectural detail. Color trends are moving away from a palette that compliments the architecture and natural surroundings of a home to exteriors that make a bold statement. Color is being used to enhance housing styles. For example, a house may have dark gray siding, crisp white trim, and a bright red door. Still, neutral colored siding remains a favorite of homeowners. Fiber cement is a mixture of wood pulp fibers, cement, and sand. The long-lasting and low maintenance product is termite-proof as well as fire and rot resistant. According to James Hardie Building Products, the leader in fiber cement manufacturing, their product is the most popular brand of siding in America. James Hardie invented fiber cement over 30 years ago. With fiber cement, homeowners are able to invest in a beautifully designed, high-performance siding that will stand up against Mother Nature. The James Hardie fiber cement siding is an authentic replication of wood. Because the panels are five times thicker than vinyl, it allows for deeper grooves. Thus, a realistic wood grain effect is generated. Not to mention, it is noncombustible and resists melting, warping and sagging. Composite siding is made from recycled materials and has the look of natural wood boards. You don’t have to worry about rotting and the inconvenience of continual care. CertainTeed’s ICON composite siding is durable with high wind load ratings, and a resistance to moisture, which hampers the growth of mold and mildew. Unlike wood, composite siding doesn’t peel, crack or warp. Manufactured architecture stone veneer gives you the same warm, inviting charm as real stone, but at an affordable price. CertainTeed Stonefaçade™ has an easy to install panelized system that imitates the appearance of natural Ledgestone. You can intermix the stone façade with CertainTeed cladding material to create a classic and timeless combination. The process for making engineered wood includes taking wood chips and breaking them down until they are the size of fiber. Afterwards, resins and wax are added and everything is bonded together through heat and pressure to form a panel that resembles lap siding or shingles. Engineered wood is biodegradable and baked on factory finishes reduce maintenance. LP Building Products offer treated engineered wood siding that upgrades curb appeal while safeguarding your home against costly repairs. LP® SmartSide® Trim & Siding features an innovative four-component SmartGuard® manufacturing process that ensures endurance and blocks fungal decay and terminates. Many homeowners may regard vinyl as unsustainable because it’s made from polyvinyl chloride (PVC), which is a chemical compound that doesn’t degrade. However, vinyl siding is recyclable. Ply Gem is committed to offering siding that affords comprehensive protection. The company’s Mastic vinyl siding is a low-maintenance product that duplicates freshly painted or stained wood. You can choose vertical or lap siding. Steel siding is recyclable. So that means it can come from sources like salvaged cars and discarded metal. Alside’s Satinwood® steel siding is designed to simulate a natural wood grain finish. The rugged construction is made from roll-formed 29 gauge G-90 galvanized steel, which contributes to the siding’s exceptional strength and impact resistance. The siding is manufactured in three profiles. They are clapboard, Dutch lap and board and batten. Many siding manufacturers are heeding the call for more sustainable products that lower energy consumption and cause less harm to the health of humans and animals. The best way for homeowners to make a decision about siding is to contact a professional contractor. A contractor can explain the benefits, features, cost, and sustainability of each type of home siding that pertains to a homeowners specifications and style preferences. You can also use HOVER’s application to see what each of these siding materials in different colors will look like on a 3D model of your actual home. Your contractor can also use HOVER to get access to detailed measurements of your house in order to pull together an accurate estimate.